Hi, Nick ,Pauline, many thanks for sending this on, really enjoyed reading it . Jeremy Bicknell also picked up on the Spanish paper on growing walnuts for timber, which developed into a discussion on this topic. That will be good to reproduce in a later blogletter. Many thanks for latest blogletter. So interesting to hear about walnut growing in China and Jeffrey’s account of his visit there. Let’s hope that some of the disease problems that they face don’t find their way here too quickly! Good point Doug. If you have no obvious deficiency symptoms, like “Snake-heads” or poorly formed shells, and have not had a leaf analysis that shows Boron deficiency, you should NOT BE APPLYING ANY MORE THAN A MAINTANANCE DRESSING OF BORON! Boron is toxic stuff. Then I had a rather cryptic exchange with Roy Hart. Most of you will know that Roy is a retired research scientist of some note, with a great reputation for down-to-earth research on feijoas among other crops. Roy, Good to hear from you. I am not sure what you are getting at here. The last example that David Whyte gave, “‘Unpublished’ California work” made the point that there was a worthwhile response to Boron even though the leaf samples show the level was “adequate”. Similarly I have found I get deficiency symptoms even though my leaf analyses are showing “adequate” Boron levels. Actually I have found leaf analysis unreliable for Potassium too. My place has almost toxic levels, but the leaf analysis says it is “adequate”! So presumably you are coming from a different experience and can shed light on the discussion from this different perspective. Thanks, nick. Now there’s a provocative thought for the blogletter. I wonder what other walnut growers have found? On one hand I would have to agree with you. My first fertilizer experiment on walnuts I put an extra dressing of Urea on some plots midsummer and found it actually depressed growth. Leaf analysis showed that it had unbalanced the other nutrients, especially magnesium. On the other hand I had an interesting response to lime a few years ago. I had failed to get around to putting lime on until December. Part way through, at a random point determined by the advent of Christmas the liming was interrupted for about a fortnight. When I got back to work I found a clear delineation where the limed trees were definitely greener than the yet-to-be-limed ones. Yes, I know, liming has no visible effect, and takes 6 months to work! What I really wanted to suggest was maybe looking at some other elements, such as molybdenum and zinc. I had never thought of Molybdenum deficiency. I don’t think I have ever come across it. Obviously you have. Is it something we should be considering with walnuts? Where-abouts in NZ does it occur? I regularly apply zinc on my place. The citrus cry out for it here, so I assume everything else must be short of zinc even though no symptoms manifest themselves – or is that faulty logic? Molybdenum. These leaves show some mottled spotting along with some interveinal chlorosis. An early symptom for molybdenum deficiency is a general overall chlorosis, similar to the symptom for nitrogen deficiency but generally without the reddish coloration on the undersides of the leaves. This results from the requirement for molybdenum in the reduction of nitrate, which needs to be reduced prior to its assimilation by the plant (see textbook Chapter 12). Thus, the initial symptoms of molybdenum deficiency are in fact those of nitrogen deficiency. However, molybdenum has other metabolic functions within the plant, and hence there are deficiency symptoms even when reduced nitrogen is available. In the case of cauliflower, the lamina of the new leaves fail to develop, resulting in a characteristic whiptail appearance. In many plants there is an upward cupping of the leaves and mottled spots developing into large interveinal chlorotic areas under severe deficiency. At high concentrations, molybdenum has a very distinctive toxicity symptom in that the leaves turn a very brilliant orange. Which I guess is Roy Hart’s point that Molybdenum deficiency could also produce distorted shoots that could be taken for “Snake-heads”, like Boron deficiency. As if growing walnuts was not complicated enough! Thanks, Roy! Now where did I put that last leaf analysis report? Is has nothing to do with walnuts. At Massey Agricultural College, 1949, they had a glasshouse for tomatoes. It was sub irrigated ,i.e. water coming up from underneath. They were told the crop was suffering from boron deficiency, so the recommended application was put on; got a good crop, so repeated the application the following year. Result, no crop, so there are definite risks from overdosing. I have a much more relaxed attitude to weed control. Maybe a plant growing in the wrong place (your definition) is a plant unappreciated for its benefits? I postulate that once a tree has its leaves above ‘weed’ height – the ‘weed’ will not affect sunlight capture, and the tree’s roots will have the capacity to exceed the ‘weeds’ roots in both depth and distance. The ‘weeds’ shelter and shade of the soil will contra it’s water uptake, and the ‘weed’ itself will act as a living mulch, decomposing and replacing any nutrients used in the short term, and improving soil and soil biology in the long term. In fact I contend that the difference between a purposeful understorey or a herbal ley and ‘weeds’ is only the perception of man – but then I am not trying to harvest walnuts. Just thought I would submit an opposing view. Blog letter was great. Attached an article on Boron I printed in the TreeCropper Dec 2011. [You should be able to look this up online.] Organibor have said they will be at our Hamilton Conference on the Friday. Just a small note about glyphosate, two years ago I used it on convolvulus, put on with a cotton bud only on the leaves, that got into the soil and killed, a Michaelia, Raphiolepis and Rhododendron Don’t forget Roundup prevents water penetrating into the soil too, since writing your piece a lot more alarming news about this stuff. One odd comment from Nettie Groenendijk, she did not use sheep manure from under woolsheds, the worm drenches used killed earthworms. The moral is, there are always side effects with chemicals; we nearly used D.D.T. for grassgrub. Glad we didn’t. …… alternatively you could just learn to love your weeds! Apart from removing the odd clump of couch, which impairs water distribution by sprinkler, we mow and live harmoniously with the weeds! A word of caution about use of Grape Marc (winery pressings of skins seeds etc) – we used some composted onto out new tree nursery two years ago …… and lost all of the walnut seedlings….. and also lost other plants in the nursery. Had the soil tested and it was found to be exceedingly high in potassium. (Currently growing it out with corn and slowly getting on top of the problem.) Thought this was just our bad luck when another Treecropper reported using some in his nursery and loosing the plants….. and a soil test showing similar results. Not sure whether others have had a similar experience….. but if others are considering grape marc I urge caution. A bad frost (from 9.30pm to 7.30am ) with no inversion layer end of November caught our walnut trees just as the leaves were unfurling and male tassels fully exposed …… as they say – the rest is history! 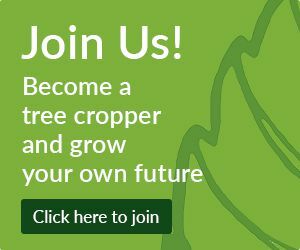 Felt that we had lost mature trees as some had no leaves even up to 2 weeks ago – however things are now greening up and most trees will survive! Pleased things look good in the North as you have had your challenging years – our turn this year! Sorry to hear about that frost wiping out your walnut crop. At the time I was worried about you South Island growers, but when I heard the Canterbury orchards were O.K., I thought we had got away with it. Thank you for pointing out the alternative way of managing the orchard floor, and confirming my contention that with weed spraying it is all or nothing. I must admit that if I was machine harvesting my crop I would be tempted to go with the mowing option just because of the dust on bare dirt. Thank you for the warning about Grape Marc. Potassium toxicity can be a real problem. Too much chicken manure can cause it too. We have the problem with a naturally high Potassium level from our soils derived from greywacke, so have to be careful not to add anything that contains Potassium. Some parts of the property are worse than others. On these we have found putting on extra Phosphate and Magnesium has helped. Hi Nick, I was interested in the pictures of your tree with the oozing sores on the trunk. If there is a similarity, it could be worth phoning Biosecurity NZ and asking about it, and maybe sending them a pic. I have copied the contact details for the person responsible for our manual below. for your input. I am actually reasonably sure it is Phytophthora as a tree has died from it a short distance away. But I was not aware of the PEQ Testing Manual and all the information that it contains. Looking at the photos, it is definitely not deep bark canker. The way to see if it is shallow bark canker is to chop into it and see if goes below the bark, and compare it to the left hand photo. I will do that next time I am in that part of the stand. Either way, this will be a good topic for the next blogletter, because I doubt if many people are aware of this manual. It would be great if you could do a write up for us – a paragraph or 2? Perhaps raising our awareness of biosecurity as applies to walnuts? That’s good to hear it’s not likely to be canker. The history of these PEQ manuals is that MAF was developing them for high-value crops in the mid- to late-2000s. 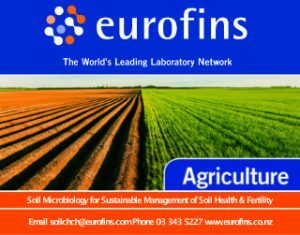 For each crop, they contracted someone from the representative industry group to write the introductory sections on the background, care and propagation of the crop, and to get in contact with researchers overseas to get photos of diseases we currently do not have here. Thanks for your further comments about the PEQ manual. Blurry picture, but you get the idea! Cut reveals that the sore kills the cambium and the surface of the wood, but does not go deeper. This discussion went on a bit, and needs abbreviating for this blogletter, So we’ll finish it with this email from Heather, which was actually accompanied by a list of web addresses. I was just listening tonight to an article on Our Changing World (Radio NZ National) about Kauri dieback, which is caused by a species of phytophthora. Symptoms include weeping gum from the trunk. It got me thinking again about the weeping cankers you noticed on your walnut trees. I think we have a few dark brown/black damp-looking patches on trunks of our trees too. Anyway, I did a bit of searching on the internet for pictures of phytophthora symptoms on tree trunks. There are various reports etc. on this page but I don’t think there are any pictures. Other responses also showed a healthy concern for walnut tree health, and will be a topic we aim to cover more of. Re the oozing sores picture. I wrote a while back to say that I had had something similar with a number of my trees. I but never got around to sending you a picture, but that picture does look pretty much the same. I have no idea exactly what is going on there, but have found that a way to stop it spreading further – as evidenced by the apparent bark staining around it, was to cut it right out with a sharp knife back to clean healthy bark, then spray the resulting wound with a broad spectrum fungicide. I am afraid I cannot remember what I used. It was a mix of what I had in the shed from when we grew calla lilies. 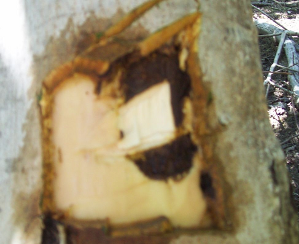 I found that under the “stained” area the active cell layer of the bark right against the wood was badly infected. I suspect that if left it will kill the tree. This email has already got too long, so I will finish it with this interesting news release passed on by Anna Brenmuhl. I am using it as a handout when selling nuts. Scientists have found nuts slash the risk of dying from heart disease by at least 55 per cent and from cancer by 40 per cent. Overall, nut eaters in the study had a 39 per cent lower risk of death and walnut eaters in particular a 45 per cent reduced danger. The results of the study of 7,000 people aged 55 to 90, by researchers at the Rovira i Virgili University in Tarragona, Spain, are published in the journal BMC Medicine.